After a bus toppled and fell into the VC Nagar canal in Mandya district on November 24, the state government launched a crackdown on private vehicles. Officials are checking insurance, registration and permits, emission certificates and Fitness Certificates (FC) during the inspections. Precautionary measures are being taken to prevent future accidents as the bus submerged did not belong to any government agency and is suspected to be in poor condition. Unregulated private vehicles pose a problem to safety of passengers. Section 56 of the Motor Vehicles Act, 1988, says that private vehicles need to take the mandatory fitness checks after 15 years, not annually like commercial vehicles. Recently the Supreme Court endorsed the National Green Tribunal (NGT) order issued in 2015 banning private vehicles more than 15-years-old in New Delhi. In Bengaluru, out of the 74 lakh vehicles plying on roads, 16 lakh vehicles are over 15 years old, of which 3781 are buses. BMTC buses pay Rs 3 to 4 crores as toll charges every year, while going via Hosur, Tumkur and Ballari road. While passing through Sadahalli toll gate on Ballari road, a single BMTC bus has to generally pay Rs 800, eating into the daily revenue of Rs 3,000-4000. Most importantly, for the first time, 300 BMTC buses are paying to use the state highway from Bengaluru to Hindupur. 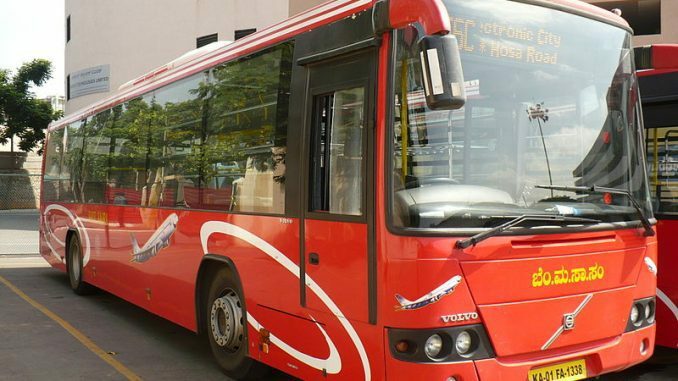 As this directly affects the price of tickets, BMTC and KSRTC have written to the authorities in the past, opposing it. 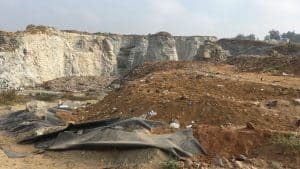 After protests against the indiscriminate dumping of garbage in Terra Firma on Doddaballapura road and Mandur, Bellahalli quarry was developed as an alternate site. This will inevitably shut down in a few months as it reaches full storage capacity with the 2400 tonnes of garbage dumped everyday. The other location identified to convert into a landfill is a quarry spread over 8.2 acres in Hullahalli, where BBMP plans to dump 500 tonnes of garbage daily. The Palike applied for an exemption from inviting tenders under section 4(a) of the Karnataka Transparency in Public Procurement Act, issued during natural calamities. The Urban Development Department rejected the plea and informed BBMP on November 2 that work to develop Hullahalli quarry area can only start by inviting tenders. This delayed the process of finding a solution to the mounting heaps of garbage. Similarly, more than 500 tonnes of Refuse Derived Fuel (RDF) is piling up in Dry Waste Collection Centres (DWCC). Fifteen tonnes of inflammable RDF accumulated in Shettyhalli (ward 12) caused a fire last week. In a meeting on November 2, BBMP and KSPCB officials met cement factory representatives and discussed concerns such as high transport costs and low calorific values. It was decided that BBMP would shift the RDF material immediately from DWCCs to waste processing units and shred the waste to smaller bits to reduce the volume. No action has been taken yet. On November 24, the division bench of the High Court heard the impending PIL against BBMP to remove unauthorised hoardings in a special sitting. BBMP counsel V Sreenidhi informed the court that while 55 hoardings were removed, 1800 remained. Majority of the hoardings are caught up in individual cases of their own, due to stay orders, injunctions and pending disputes over authorisation. The BBMP could not complete the task for this reason, and told the court it will put together a list with the details soon. A committee within the Palike is analysing bylaws pertaining to Outdoor Signage and Public Messaging by going over 1200 inputs from the public. Of them, 800 want to be heard privately. BBMP is considering holding hearings for them, the counsel said. Meanwhile, an FIR registered against Minister DK Shivakumar and others for allowing an illegal structure on his property in Panatharapalya on Mysore Road by Rajarajeshwari Nagar Revenue officer Muthuraj on September 24 was closed with a ‘B’ report once the structure was removed. The petitioner protested against the attitude towards the state’s Irrigation and Medical Education Minister. He also alleged that the sub inspector who registered the FIR got transferred. The High Court of Karnataka asked the Advocate General Udaya Holla to get a respond from the police on the matter. 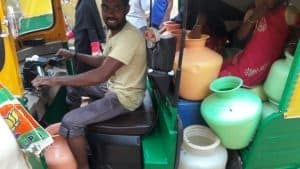 Residents in Vijaynagar village in Mahadevapura stuffing pots into an auto en-route to collect water from BBMP tankers. Pic Credit: Gopinath P.
An ongoing study by Institute for Social and Economic Chane (ISEC) has calculated the per capita consumption of BWSSB water for domestic purposes across localities. The findings say that residents in older and upscale localities like Yelahanka Satellite Town, Koramangala, Gandhinagar, and Halasuru consume water up to 200 litres per person daily. The consumption is higher because these areas are close to storage facilities, have bigger houses with private automobiles, says Professor Krishna Raj. On the downside, Gottigere, Herohalli, Singasandra, Horamavu and Jakkur and other poorer locales, consume less than 10 litres of BWSSB water per person. In July, the government had proposed increasing the tariff for water drawn from manmade resources to Rs 3 lakh from Rs 3,200, and for natural resources from Rs 1800 to Rs 1.5 lakh. Charges are applicable for every tmcft of water. The representatives of the iron and steel industries continue to lobby against it while the government is yet to revise the rates. Chief Minister has asked irrigation minister DK Shivakumar and industries minister KJ George to make a final decision soon. The 21st edition of the Bengaluru Tech Summit spread across three days was flagged off on Thursday in Palace Grounds. It is organised every year for startups to collaborate and learn from one another, exchange ideas with MNCs and international business giants. Chief Minister HD Kumaraswamy spoke at the inaugural event. He promised to set up a statutory body to help startups navigate legal hurdles in Bengaluru, where the industry is valued at 19 billion dollars. He added that a legal framework will be established to guard intellectual property by setting up a block chain based IP registry. The last day will have a drone racing competition with 30 of India’s best players competing against three companies from Israel and one from Germany. Solutions to real-world problems like prosthetic limbs using IoT and early stage gas detection technology in oil and gas pipelines were showcased. BBMP is planning to pilot an automated mechanism to identify bad roads in Bengaluru East. The vehicle equipped with a camera will highlight potholes by marking coordinates through GPS. Chief Engineer BS Prahallad said costs are still being calculated, and if successful, the Palike will use the initiative titled ‘Pavement Condition Index’ across the city. Bangalore’s citizens find themselves having to pay the price for ineptitude in the government sector. How long are we going to put up with this apathetic attitude? Durga Foundation and BMTC team up to make travel safer for women and children. 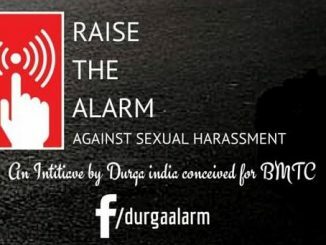 The Durga alarm will help alert others in case of harassment on BMTC buses.